​Both prints are 8" x 10"
I graduated from high school in Milford, but soon afterward I was married and living in Seaford where my husband and I worked for the world's first nylon plant, DuPont. 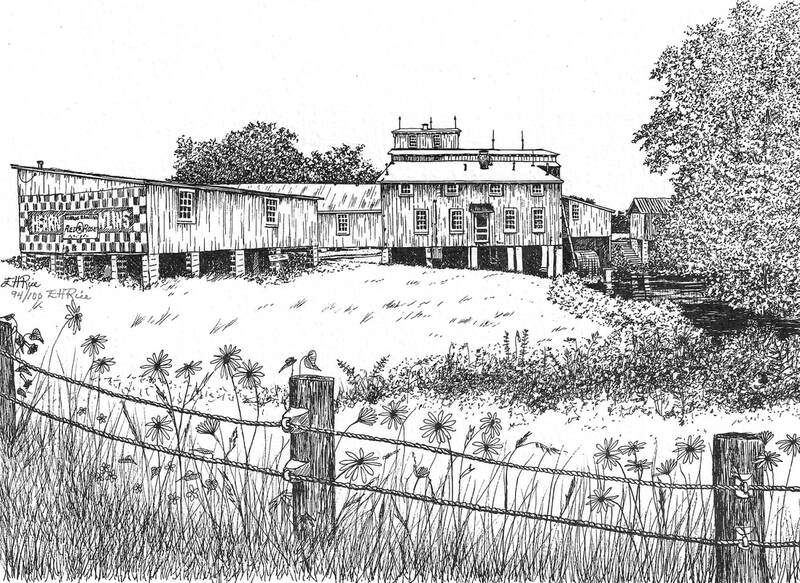 After my son was born, I stayed home and started doing pen & inks of some of the beautiful old historic places in western Sussex County for the covers of a monthly publication known as Tidewater Times. Hearn's Mill wasn't just a painting subject, it was a place I loved to go. I could buy stone ground whole grains for the bread loved to make (the old fashioned way with hand kneading) and also get to watch the original mill roll around as it had for around 100 years. Hearn and Rawlins Mill, also known as the Cannon and Ross Mill and Hearn Mill, is a historic grist mill complex located near Seaford, Sussex County, Delaware. It was built about 1880, on the site of a previous mill built in 1820. It is no longer in service, but was a water powered mill with two overshot wheels installed in 1912. The mill and two associated warehouses are frame buildings, sheathed in metal, on brick footings. They are located on an earthen dam, rebuilt in 1912. It was added to the National Register of Historic Places in 1978. Take a ride back in time someday to a piece of Sussex County history.